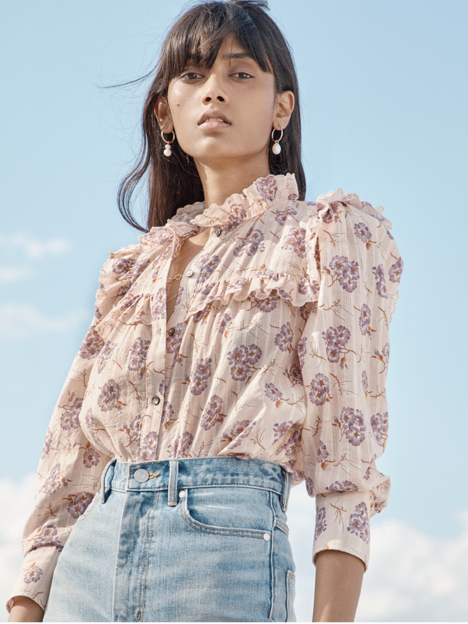 Sprigged with delicate flowers, this shoulder-baring top has flouncy ruffles encircling the neckline and the short, smocked sleeves. Sprigged with delicate flowers, this shoulder-baring top has flouncy ruffles encircling the neckline and the short, smocked sleeves. Try the button-down tucked into tailored high-rise pants or worn casually with jeans. Either way sets the tone for fuss-free spring style.